Quote Of The Day: "Beauty begins the moment you decide to be yourself"
Kale Enzymatic Exfoliating Cleanser is a 3 in 1 product by the brand Nourish, it can be used as a Daily Exfoliating Mask, a Gentle Cleanser and also a Weekly Revitalising Facial. This product is also for all skin types. This truely multi-tasking treatment is a cleanser, mask and facial - all in one product. Kale Enzymatic Exfoliating Cleanser features pomegranate enzymes to gently exfoliate and reveal a smoother, healthier complexion while organic kale extract helps to increase suppleness. Healing probiotics oxygenate whilst griffonia extract provides a protective shield against daily environmental aggressors. Use in one of three ways, cleanser, mask or facial, to provide you with the optimum cleansing for your skin. 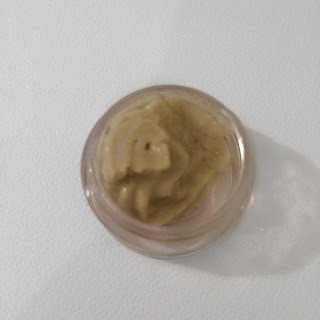 I was recently sent 2 little pots of this Kale Enzymatic Exfoliating Cleanser to try out and do a review on them, and after trying it out in the 3 different ways in can be used i will definitely be purchasing the full product very soon! This says to smooth over dry skin, leave for 2 minutes and then rinse with cool water. At first i wasn't too keen on the smell of the product, but for the 2 minutes that i left it on my skin for it felt really nice and whereas other face masks go rock hard so that your unable to move your face, this one felt like i didn't even have a mask on. After rinsing my face with water it left my skin feeling really soft and that was just after 1 use of it. This says to massage gently over wet skin, then rinse with cool water and pat face dry. I wasn't too sure on the texture of this when being applied to wet skin, but after a few seconds it felt weirdly nice whilst rubbing it into the skin like it was really cleansing my skin without being too harsh. I spent about a minute rubbing it all over my face and straight away i could tell that my face felt clean and soft and that was before i even rinsed it off. After rinsing it off and drying my face it left it feeling so soft that i didn't even need to apply a moisturiser onto my face over night, and my skin was still feeling soft and clean the next morning. This says to apply as a mask then leave for 5 minutes, after 5 minutes spritz with toning mist or water to soften the product, then massage gently and rinse with cold water and pat to dry. I decided to do this one first thing in the morning when i had nothing planned for a few hours. As soon as i started applying it, it instantly made me feel wide awake (lets forget morning coffee....I'll use this instead haha) It felt so fresh and was just lovely. I left it on for the 5 minutes that it says to before gently tapping my face with water to soften the product, before washing it all off thoroughly. It was pleasantly easy to wash off unlike other masks it didn't take forever to remove, it took me roughly 5 minutes. After testing Kale Enzymatic Exfoliating Cleanser out in all the 3 different ways it can be used, I must say I'm really impressed with this product and can definitely see myself purchasing the full product very soon. I think i will also be looking into their other products by this particular brand and trying them out aswell. 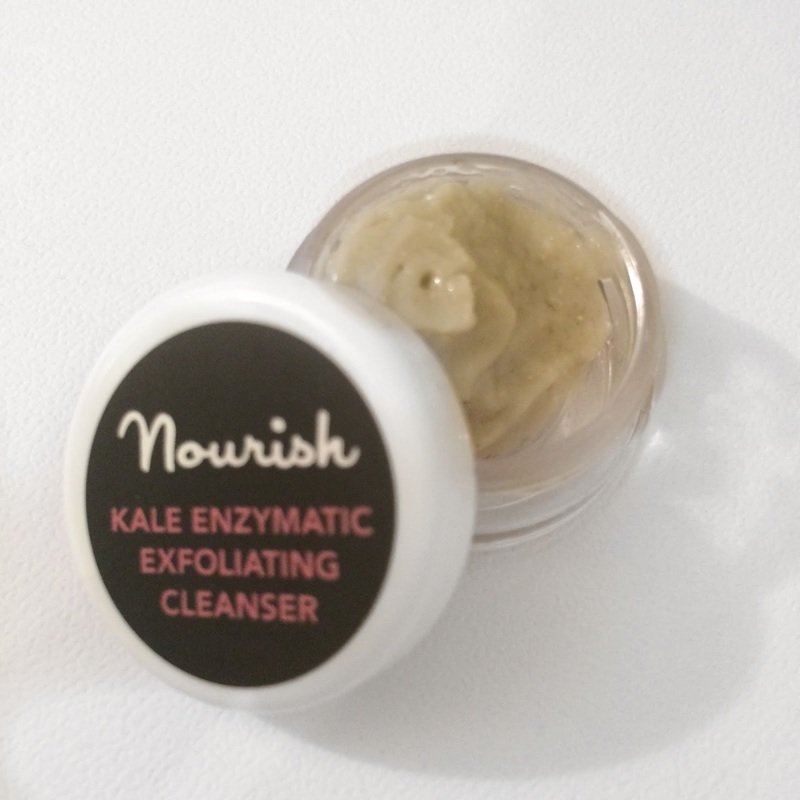 The Kale Enzymatic Exfoliating Cleanser can be purchased HERE and it costs £16.50 for 50mls, which I think it quite a good price myself. 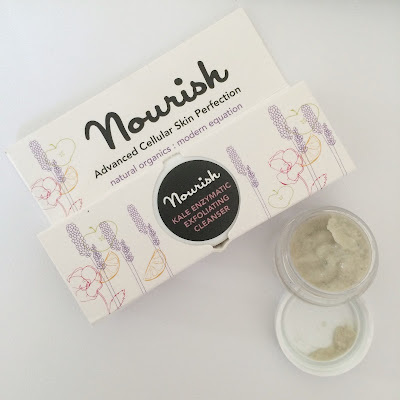 Have any of you tried this product or any other products by Nourish?